Two Truths and a Lie is a classic get-to-know-you icebreaker. Players tell two truths and one lie. The object of the game is to to determine which statement is the false one. With absolutely no tools required, this team building game can be done anytime and anywhere. Why we love it: This really is a team building icebreaker at it’s best. This exercise gives employees equal footing to reveal facts about themselves as well as expose the assumptions others have made. Visual scavenger hunts are among the most popular team building activities. Draw up your list of items for your teams to photograph. These can be street signs, local businesses or even objects in your office. Where we love it: This is a great choice if you’re interested in city-based corporate team building activities. Cities are full of landmarks and you won’t have to stray too far from the office. Topgolf makes socializing a sport. Founded in 2000, this chain of golf-based theme parks operates 28 locations across the United States and three in the United Kingdom, with seven more set to open this year. Anyone can play Topgolf, from aspiring pros to those who’ve never walked 18 holes. All you have to do is swing a club and try to hit your microchipped balls into dartboard-like targets. Why we love it: Because of the way the game is structured, people who have never touched a golf club before can hold their own against seasoned veterans. It’s competitive, fun and always better with a big group! There are some funny videos out there of people pulling the wrong pieces and collapsing massive Jenga towers on themselves. To begin, all the wooden blocks are stacked on top of each other. Then the game begins. Each player takes a turn choosing a block to remove. The goal is to remove a block from the tower without it falling over. Why we love it: Jenga challenges the players mental skills and agility in a fun manner. Take your company’s mission statement or document that describes their company. Add blanks to parts of your mission statement/company policy and in those blanks, write Noun, Adjective, Verb, etc. Either fill them out as an entire group or have everybody fill them out separately and then share. Why we love it: This team building exercise brings your team together and reminds everybody about company values all while having fun. Escape games combine elements of the theater with gameplay and special effects, and are becoming increasingly popular. Teams are locked in a room and are given a time limit to find the clues they need that lead to key to exit the room. Why we love it: Team building with escape rooms increases creativity and enhances problem solving skill. It’s about the experience, not whether you could escape or not! Ping pong tables or Foosball tables in the break room have become a common sight at many corporate offices. This means that several co-workers can participate at once and have team fun. If you lack sufficient space in your office you can also use the ping pong table for a meeting! Why we love it: Nothing boosts a company’s morale like fun and friendly competition within the office. 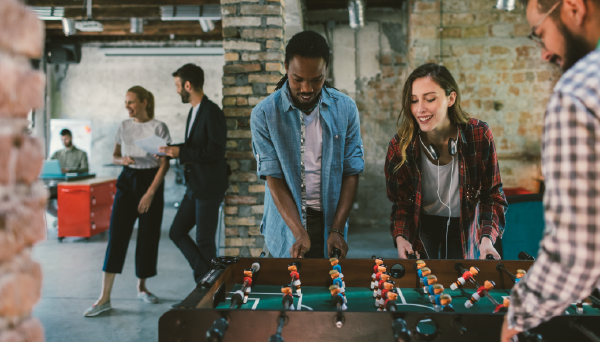 These games bring out the competitive as well as the playful side in employees. This team building activity can be a great, but quick distraction from the workday. Just like the quirky television show, but with a corporate twist! Corporate Family Feud can have questions surrounding the company’s product or fun questions based on the employees. Split your employees into two teams and start asking away. Allow each team to collaborate on their answers to encourage communication. Why we love it: This inventive and entertaining team-building event is a hilarious and novel way to introduce or reinforce corporate product knowledge in a large-group setting! Board games are a great way to bring people together. Board games are the perfect way for small teams to work together, without the stress of meeting deadlines or endless rounds of emails. Why we love it: Board games help exercise the brain in a fun way. It’s a great distraction from ‘work talk’ and can uplift the mood in the office. You might remember this game from the tv show, The Office. Names are placed blindly on employees’ backs. These names can be celebrity names, sports teams, or a category (such as firefighter, tennis player, or teacher). Employees mingle, ask questions to one another, and try to figure out what name they have. Often, hilarity ensues. This game is a great ice-breaker. Why we love it: This game takes about ten minutes in a group of 50, less for smaller groups, but about the same for bigger groups. This is a great way to get people talking! The task is simple: create a package that will allow you to drop your eggs from 2-4 storeys up without it cracking. The teams have a wide assortment of materials to choose from, and they can use any and all of them to build the most effective, safest package. Why we love it: The purpose of the game is for everyone to work as a team towards a common goal. It also forces the team to communicate with each other in an effort to create the package and use the less amount of materials. Geocaching is a high-tech treasure hunting game played throughout the world by adventure seekers equipped with GPS devices. The group is divided into teams of two or more. The goal is to find a specific number of items that are hidden somewhere, for example, in a field. If you are looking to bring the excitement of Geocaching to your next corporate event, then turn to Geoteaming to create an unforgettable experience for your team. Why we love it: If you’re on the hunt for a dynamic, unique team-building program, if your team wants to be stimulated, challenged and inspired in the outdoors – The Geocaching Challenge is the activity for you. Start by dividing the group into two teams. One team (team A) is the “infield.” The other team (team B) is the “outfield.” Team A starts by throwing a rubber exercise ball anywhere in the designated area. The ball must be allowed to land on the ground. Once the ball has been thrown, team B runs toward it and forms a single file line behind it. The first person in line picks up the ball and passes it over his or her head to the person directly behind, who passes it backwards through his or her legs. This over-under pattern continues until the ball has reached the end of the line and the last person yells stop. Now, team A and B have to reverse the tasks, and the team which makes maximum runs wins the game. Why we love it: Energizes a group with physical activity and challenges teams to work well together! Divide your group into equal teams of three to five people and give each team the same number and sizes of Lego pieces. Whichever team can build the tallest free-standing structure in a set time period (around 10 or 20 minutes) wins the challenge. The towers must stand on their own for 60 seconds. Why we love it: Lego isn’t just about fun and games. For team building exercises, working with Lego helps enhance creative and critical thinking skills while giving employees an opportunity to act like kids again. Employees are grouped in pairs and put in an open area with different obstacles. One employee has to walk through the obstacles blindfolded without bumping into anything, while his partner gives instructions from the other side. Why we love it: This team building activity helps build trust between employees. Participants learn to recognize and follow the instructions of their team members. Finding the right corporate team building game can be difficult, but as long as your team has a bit of fun, and nobody gets embarrassed, the game will be a success. Here at Deputy, we are always looking for new ways to bring the team together. Have you tried any of these games? How do you break the ice and build better bonds? Do you have any games to add to this list? Let us know in the comments below. The post The ongoing list of team building games appeared first on Deputy.